Welcome to Morocco - The exotic gem of a country offering a fascinating blend of Arabian, Berber, and European cultural vibes. Straddling the edges of the Atlantic Ocean and the Mediterranean Sea, the North African country strikes all your senses. There are sweeping deserts and magnificent mountains that will leave you awestruck. There is a wave of cosmopolitan cities with their towering buildings and olde-worlde towns with lingering spicy-warm scents waiting to be explored, and of course, the cuisine and architecture are not to be missed. Let’s begin the Moroccan adventure! Some people call Morocco an Arab-Amazigh country, while many Moroccans insist for it to be called an Amazigh-African country. Berbers and Arabs have ruled the country for centuries, and their cultural influences and rich heritage can still be seen today in various forms of art, music, domestic architecture, cuisine, and traditional clothing. Every city you visit will surprise you with its uniqueness. It will take a while to learn the local customs and traditions as each town holds a distinctive ambience. Each city has a historic heart, termed as 'medinas', featuring winding streets lined with cafes, restaurants, and quaint houses. It is best to explore the ancient medinas on foot. On the way, learn to sharpen your haggling skills and buy handicrafts from vendors, sip on your mint tea and enjoy the pleasant stroll. 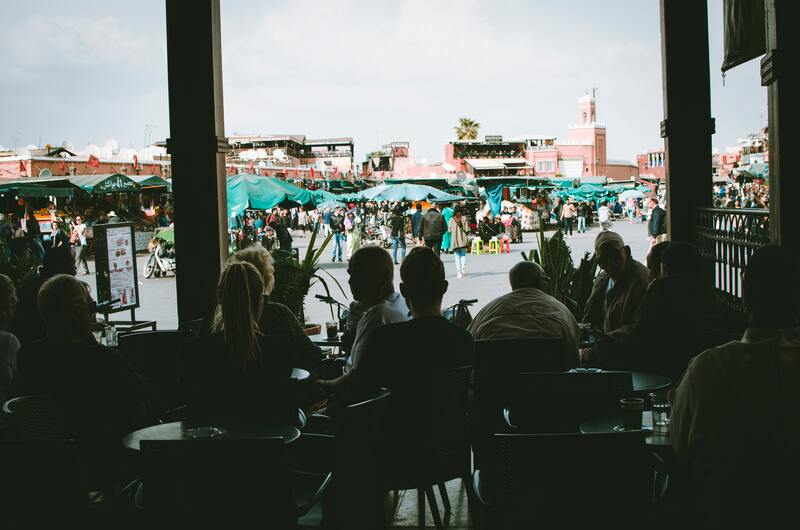 Before you step inside Marrakech, ditch Google maps, be prepared to get lost, and make sure you have a warm coat handy. One thing is for sure and certain, it is easy to fall in love with the imperial capital. From the ancient artisan heritage to the breathtaking beauty of the Atlas Mountains, Marrakech is a charming amalgamation of serene nature and offbeat hustle and bustle of the city. Bahai Palace and the Dar Si Said will amaze you with their intricate tile work and beautifully-carved ceilings, while the medina will give you a glimpse of culture and locals. Do splurge on traditional carpets and spices on souqs (open marketplaces). The imperial city was once the capital of Morocco, and it still remains one of the most important religious centers of the country. The city appears to be a skillful brew of medieval art, ancient sites, dizzying mazes, and luxurious buildings, and it will be akin to traveling back in time. Fez is best explored on foot. The narrow streets and alleys of medina crowded with people may look intimidating at first, but you will blend in in a matter of seconds. Afterwards, walk to the Bab Boujloud (Blue Gate) embossed with blue and green Fassi tiles and learn the history behind it. The impeccable Jnan Sbil Gardens and crumbling Merenid Tombs are also worth a visit. If it's October, you can plan to attend the Tissa Horse Festival, and watch adrenaline-rushing fights between rivals. Sitting at the foot of rolling hills, the whitewashed city is situated on the North African coast guarding the western entrance to the Strait of Gibraltar. From renowned writers and spies coveting secrets to foreign diplomats and curious tourists, Tangier has been managed to stand out thanks to many strong influences. Here you must visit the Caves of Hercules where the Greek hero is allegedly resting, navigate the labyrinth of the medina encircled by the walls of a Portuguese fortress, take a stroll in Mendoubia Gardens with your loved ones and have a seaside picnic at Tangier Beach. Right across the raging waves of the Atlantic Ocean, Casablanca sprawls with its French colonial heritage, Moorish vibes, and European art. The port city is Morocco's major commercial hub, but it is just as romantic as it has been portrayed in movies. From ornate mosques to marvelous churches, the city is a blend of religions and cultures. If you are a history buff, you will love the diverse collection of architecture here. Pay a trip to Hassan II Mosque, Casablanca Cathedral and Mohammed V Square and you will see some of the finest Art Deco and Gothic designs. When compared to the beaches of Tangier and Essaouira, Casablanca is often overshadowed, but there is a secret haven for surfers waiting at Casablanca's beach! Shadowed by the towering peaks of the Rif Mountains, Chefchaouen is your Instagram-worthy destination. It is as if you have entered a scenic painting. Set against the verdant countryside, the bright blue houses and buildings, cozy hole in the wall spots, delicious cuisine and a buzzing medina are enough to steal your heart. Walk the weaving cobblestoned streets, hike the blooming trails, and check out the contrasting red-walled Kasbah boasting dungeons and fortresses. The resort city of Essaouira is a heaven for water-adventurers. Its crescent-shaped beach is ideal for surfing, kitesurfing, and windsurfing. Besides the famous beaches and salty breezes, the oceanfront town is brimming with fun-filled opportunities, scrumptious seafood, and charming sights. The old part of the city has weaving lanes lined with colorful houses where you can easily spend hours gawking at the architecture and splurging in markets. Morocco's cuisine is an exquisite concoction of Berber, Arabic, and Mediterranean cultures with some influences of European and sub-Saharan regions. Tagine, a sweet and savory chicken dish cooked in a conical clay pot, is available everywhere ranging from roadside vendors to high-end restaurants. Couscous is yet another popular food prepared with durum wheat semolina and served with stew on top. It has a religious significance as it is mostly cooked on Fridays (a religious day for Muslims) but many restaurants and cafes offer the dish. Have a bite of Zaalouk and you will be forced to think differently about eggplants. The mouthwatering food is made with eggplants, tomatoes, and garlic, and it tastes heavenly! Pastilla, a traditional pigeon pie, is a perfect combination of sweet and salty. Snail soup is widely available in Morocco which is said to be healthy and nutritious. If you are hesitant to try the snail soup, opt for Bissara, soup made of fava beans, which is a safer option. Coming to drinks, you will find a variety of mint teas - each with a unique blend of flavors. The tea quenches your thirst and allow you to cool down on a sun-kissed stroll in the city. Morocco isn't big on alcohol as it is a Muslim country, but you will find a beer or two in five-star restaurants. Morocco has a thriving nightlife which is a little different than rest of the world. Rather than alcoholic drinks, it is mostly revolved around dancing and live music shows. There is a bar called Vanity in Casablanca which is tricky to find, but once you go there, you can have a time of your life dancing away with your pals. There are plenty of cinemas, art houses and theatres. Institut Français at Ville Nouvelle, for instance, hosts concerts, film screenings and dance performances that are critically acclaimed. Abdullah's, a tiny and quaint tea-shop in Fez medina, has become one of the most sought-after places among tourists. For a more happening time, head over to Beach Club 555 in Tangier, where you can enjoy rejuvenating drinks and kickback and relax in the pool. From medina riads and auberges to deluxe resorts and outdoor camps, Morocco has a wide range of accommodations suitable for all sorts of budgets and requirements. It is better to book a place in advance as there canbe shortage of rooms in big cities. Moreover, make sure to check the reviews online especially if you have kids. Morocco is one of those rare places on Earth that you canvisit any time of the year. Summer is pleasantly warm, and winters are cozy and bearable. Each city has its own high and low seasons, and even in the month of Ramadan (a Muslim event), tourists flock to the country. During summers, Juneto August, wear light and breathable clothes as it can get hot and humid. A warm jacket suffices in the winter evenings (November to February) unless you are planning to go to the snow capped peaks of the High Atlas Mountains. Traverse through the rusty Sahara sand dunes on a camel. Experience Hammam (steam baths) like a local. Visit the tanneries in Fez and watch how leather goodsare produced from scratch. Sign up for a cooking class and prepare a deliciousMoroccan meal. Trek the Rif and Atlas Mountains in a proper attire. By Air - Many cities including European cities, Dubai, Montreal and New York offer flights to Marrakesh, Casablanca, and Agadir. Booking a flight is the best and hassle-free option to travel to Morocco. By Car - Morocco can be accessed through car only via the open borders at Ceuta and Melilla. By Ferry - You can travel on a ferry to Tangier or Algeciras if you are coming from France or Spain respectively. Once within the country, trains and local buses are go-to options. Domestic flights are hardly popular, but Royal Air Maroc offers flight to several cities. In big cities, rental car firms are widely available for those interested in renting a car. The local currency is Morocco is Moroccan dirham (MAD), and it is only the currency officially accepted in the country. Some hotels might accept US dollars and European pounds, but it is best to carry dirhams with you. Travelers are advised to exchange their currency within the country as it is illegal to buy Moroccan dirham outside the country.